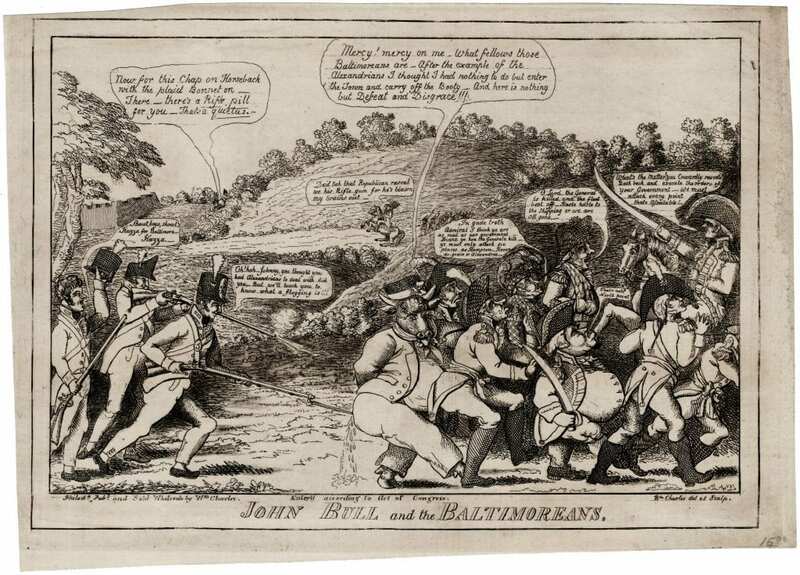 William Charles (artist, engraver and publisher), JOHN BULL and the BALTIMOREANS. Philadelphia, . Etching, 9”h x 12 ¾”w plus margins, uncolored. A strong impression, minor soiling, trimmed inside plate mark in a couple of places. Very good. A scarce and visually striking political cartoon by William Charles satirizing the failed British attack on Baltimore in September 1814. Though the British had declared a blockade of the mid-Atlantic coast early in the War of 1812, most of the first two years’ fighting took place along the American-Canadian border. 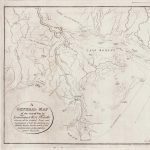 In mid-1814 however, the British shifted offensive operations southward and sent an expeditionary force under General Ross and Admiral Cochrane into Chesapeake Bay. In August they captured and burnt Washington, DC, allegedly in retaliation for the American sacking of York (Toronto), Ontario. A few days later Alexandria, Virginia—at the time a major port—surrendered almost without a fight. These two defeats marked one of the low points in American military history. The British forces left Washington a smoking ruin and sailed up the Chesapeake toward Baltimore. On September 12 they attempted a combined assault, landing troops at North Point and sending a large naval force up the Patapsco River. This time the Americans were far better led: the British met heavy, well-organized resistance and strong fortifications, General Ross was killed early on by a sniper, and the bombardment of Fort McHenry in the Harbor was a failure. The British retreated, and the victory was a powerful boost to American morale after the humiliation at Washington. Charles produced this print as a companion to Johnny Bull and the Alexandrians, which lampooned the pathetic “defense” of Alexandria. Both were submitted for copyright on October 21, 1814, along with John Bull Making a New Batch of Ships to Send to the Lakes. Charles was an illustrator, engraver and publisher active in New York and Philadelphia in the first two decades of the 19th century. Born in Scotland, trained in England, and active early in his career in both Edinburgh and London, he probably arrived in New York in or after 1806. 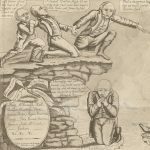 John Bull and the Baltimoreans features the boldly-etched lines and strongly-modeled figures characteristic of his work. Murrell, American Graphic Humor, #88. Reilly, American Political Prints, 1776-1876, #1814-4. Stauffer, American Engravers, #317 (mis-titled John Bull at Baltimore). 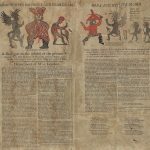 As of February 2017 OCLC locates examples at the American Antiquarian Society, Clements Library, Enoch Pratt Free Library, Library of Congress, and University of Virginia. Biographical information taken primarily from Murell, American Graphic Humor, vol. 1 pp. 79-95.